An Iranian officer accused of smuggling powerful roadside bombs into Iraq for the elite Quds force was arrested Thursday, the military said. The suspect - a member of the Quds Force, an elite unit of Iran's Revolutionary Guards - was detained in the Kurdish city of Sulaimaniyah, the military said. He was allegedly involved in transporting roadside bombs, including armor-piercing explosively formed penetrators, or EFPs, into Iraq, according to a statement. It said intelligence reports also indicated he was involved in the infiltration and training of foreign fighters in Iraq. Officials have said the Bush administration is expected to soon blacklist the Quds force as a terrorist organization, subjecting part of the vast military operation to financial sanctions. The move would be in response to Iranian action in Iraq and elsewhere. Also Thursday, the No. 2 U.S. commander in Iraq a 7-month-old security operation has reduced violence by 50 percent in Baghdad, but he acknowledged that civilians were still dying at too high a rate. The comments came as relations between the U.S. and Iraqi governments remained strained in the wake of Sunday's shooting involving Blackwater USA security guards, which Iraqi officials said left at least 11 people dead. Prime Minister Nouri al-Maliki suggested the U.S. Embassy find another company to protect its diplomats. The North Carolina-based company has said its employees acted "lawfully and appropriately" in response to an armed attack against a State Department convoy. But a survivor who said he was three cars away from the convoy denied the American guards were under fire, claiming they apparently started shooting to disperse more than two dozen cars that were stuck in a traffic jam. Lt. Gen. Raymond Odierno told reporters that car bombs and suicide attacks in Baghdad have fallen to their lowest level in a year, and civilian casualties have dropped from a high of about 32 to 12 per day. He also said violence in Baghdad had seen a 50 percent decrease, although he did not provide details about how the numbers were obtained and said that was short of the military's objectives. "What we do know is that there has been a decline in civilian casualties, but I would say again that it's not at the level we want it to be," Odierno (picture at left) said. "There are still way too many civilian casualties inside of Baghdad and Iraq." Al Qaeda in Iraq was "increasingly being pushed out of Baghdad, "seeking refuge outside" the capital and "even fleeing Iraq," Odierno said. Iraqi military commander Lt. Gen. Abboud Qanbar said that before the surge, one-third of Baghdad's 507 districts were under insurgent control. "Now, only five to six districts can be called hot areas," he said. "Al Qaeda now is left only with booby-trapped cars and roadside bombs as their only weapons, which cannot be called quality operations, and they do not worry us." A car bomb at an Iraqi troop checkpoint at the entrance of Sadr City, the capital's largest Shiite neighborhood, killed two Iraqi soldiers and a civilian, and wounded seven others. A roadside bomb struck an Iraqi police patrol near the al-Shaab Stadium in eastern Baghdad, killing one officer and wounding four others and a civilian. The U.S. military said a pre-dawn raid by Iraqi special forces and U.S. troops that included helicopter gunships in Sadr City led to the detention of seven Shite extremists. Local residents claimed a civilian and a five-year old boy were killed in the raid. The U.S. military also reported killing three insurgents during an operation in Baghdad's Baya'a area and seven others in operations targeting al Qaeda in central Iraq. Odierno said the U.S. military had separately released at least 50 detainees per day, or a total of at least 250, since beginning an amnesty program for inmates as a goodwill gesture linked to the Islamic holy month of Ramadan. After the shooting Sunday in the Mansour district of western Baghdad, Blackwater spokeswoman Anne E. Tyrrell said the employees acted "lawfully and appropriately" in response to an armed attack against a U.S. State Department convoy. But Iraqi witnesses claim seeing Blackwater security guards fire at civilians randomly. Speaking from his bed in the Yarmouk hospital four days after the incident, lawyer Hassan Jabir said he was one of the wounded when Blackwater's security guards opened fire in Nisoor Square. He said he was stuck in a traffic jam near Nisoor Square in western Baghdad when he saw the American convoy of armored vehicles and black SUVs parked about 20 yards away at an intersection, apparently following an explosion. Jabir said the Americans began yelling to disperse the vehicles, then opened fire as the cars were trying to turn around. "It is not true when they say that they were attacked. We did not hear any gunshots before they started shooting," he said from his hospital bed, where he lay with bandages on his stomach and back. "Some people, including women and children, left their cars and began crawling on the street to avoid being shot but many of them were killed. 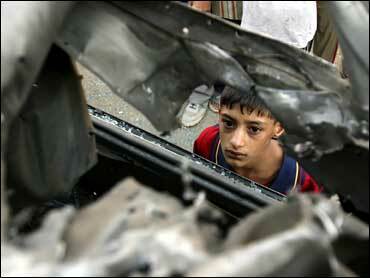 I saw a 10 year-old boy jumping in fear from one of the minibuses and he was shot in his head. His mother jumped after him and was also killed," Jabir said, adding that his car flipped over in the chaos. The incident has angered Iraqis uniting them in blaming American forces for the violence ravaging their country and backing the government's announcement to ban Blackwater from Iraq. American and Iraqi officials announced they would form a joint committee to try to reconcile widely differing versions of the incident. Conflicting accounts were circulating among Iraqi officials themselves. Land travel by U.S. diplomats and other civilian officials outside the fortified Green Zone was suspended following the Iraqi government order that Blackwater stop working. The U.S.-based company is the main provider of bodyguards and armed escorts for American government civilian employees in Iraq and banning it from Iraq would hamper and make movement of U.S. diplomats and others difficult. Al-Maliki, who disputed Blackwater's version of what happened, spoke out sharply against the company Wednesday, saying the government would not tolerate the killing of its citizens "in cold blood." He also said the shootings had generated such "widespread anger and hatred" that it would be "in everyone's interest if the embassy used another company while the company is suspended." Eager to contain the crisis, the State Department said Wednesday a joint U.S.-Iraqi commission will be formed. The size and composition of the commission have yet to be determined but its members are charged with assessing the results of both U.S. and Iraqi investigations of Sunday's incident, reaching a common conclusion about what happened and recommending possible changes to the way in which the embassy and its contractors handle security, the State Department said.